There are few things worse than standing by helplessly as a mountain of debt piles up around your ears. Being in debt can breed feelings of hopelessness and inadequacy, especially if you happen to be your household’s sole breadwinner. Rather than take the path of least resistance and wallow in your sorrows, fight back with these simple tips to reduce your debts. Plenty of debt quagmires are caused by a lack of financial discipline. It’s easy to keep track of how much you earn each month and outline a rudimentary budget for yourself or your household, but it’s another thing entirely to stick to a strict spending limit. Keeping your expenditures lower than your income requires compensating for every unforeseen necessity, like a new set of tires following a blowout or an emergency doctor’s visit for your child, with a corresponding reduction in your discretionary spending. That’s tough to do when you the majority of your monthly income goes toward household necessities, but it’s not impossible. First, determine exactly how much you make each month. Subtract 5 percent from that number as you’ll need a modest rainy-day fund for unforeseen expenses. Next, determine the dollar amount of your household’s overhead costs, like utility bills, debt payments and property taxes, as accurately as possible. For overhead costs that fluctuate over time, you may need to use a six-month running average to get a ballpark figure. Once you do, subtract it from the remaining 95 percent of your take-home pay. This difference is the amount of money you’ll have left over each month to spend on household necessities, like groceries and clothing as well as more frivolous discretionary items. The real fat-cutting begins here. Review your last few grocery bills and note any excesses that resulted in measurable waste: After all, the last thing you need when you’re trying to adhere to a budget is to buy so much fresh fish or fruit that you lose some to spoilage. Then go back through your bill and examine each brand-name purchase that you made. Brand-name food staples tend not to taste much better or be significantly healthier than their generic counterparts, which often cost considerably less. You’ll be surprised how much simply switching to generics can save you in the checkout line. If you’re neck-deep in debt and can’t seem to make much headway even after setting up a monthly budget, you’ll need to evaluate the income side of your ledger. Remember that making on-time minimum payments on your credit card balances, medical bills and lines of credit may keep you out of default, but it won’t get you out of debt anytime soon. Fortunately, there are a couple things that you can do to augment your existing income stream even if you don’t expect a promotion anytime soon. If your employer pays you by the hour, simply offer to work more: It costs far less to pay an existing worker for a few hours of overtime each week than it does to hire and train a brand-new employee. If you’re salaried and haven’t seen your pay increase in a while, have a heart-to-heart conversation with your boss or your office’s payroll manager and explain that times are tight. You won’t know what they’ll say until you try, and even a modest raise would surely be better than the status quo. Don’t be discouraged if your employer is unable or unwilling to accede to your demands for more pay. After all, they may be feeling the financial squeeze every bit as much as you are. As long as your family schedule allows for it, consider taking a part-time job in the evenings or on weekends, even if it means swallowing some pride. There are plenty of $10-per-hour, 15-hour-per-week jobs out there, and they’re increasingly being taken by career men and women forced back into the hourly workforce by financial necessity. Concentrate on paying down your outstanding debt balances with the income from your second job to ensure that you won’t need it five years down the road. Regardless of how you plan to reduce your debts, you should pair any attempt to increase your income or control your expenditures with enrollment in a debt consolidation program. 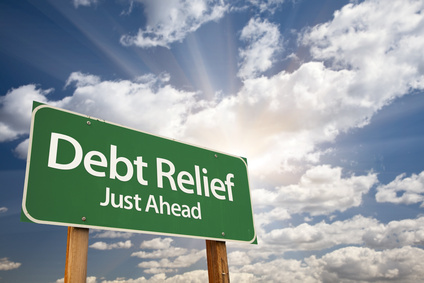 Unlike risky debt consolidation loans, ineffective credit counseling services and credit-destroying bankruptcy proceedings, debt settlement can reduce your debts in as little as two or four years with no upfront costs. In fact, debt settlement is the only form of debt relief that actually slashes the principal on your outstanding debts rather than merely trimming a few points from your annual interest rate. Every situation is different, but debt settlement may reduce your debts to a fraction of what you owe and save you thousands. Make a move to lighten your debt burden today and start looking forward to a worry-free tomorrow.